One Love Animal Rescue does not have a public facility, rather works from a foster network within our community. Each of the animals listed in our animal gallery are located in various foster homes within our community and we would be happy to schedule a meet and greet with them. All members of the adoptive household must meet the pet. 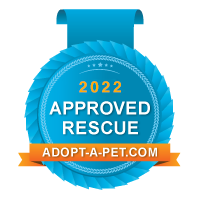 Adopter must provide vaccination records of all current resident pets. At minimum, felines must have a FCVRP rabies vaccines and be tested for Felv/FIV and canines must have rabies, DHPP and be heartworm tested. Complete the Adoption Agreement and supply requested donation. All of our canine adoptions are $200. As a dog 6 months of age or older, they will be fully vaccinated, spayed or neutered and microchip. Puppies under 6 months of age will fall under our Puppy voucher program and your adoption donation will include all vaccines, microchip and alter as the puppy comes of age at one our 3 participating veterinarian hospitals. Our feline adoptions are $85 for kittens under 1 year old and $55 for 1 year and older. Cats and kittens will be fully vaccinated, microchipped, tested and altered. One Love requires all adopted cats and dogs to live indoors as they have already had a tough start at life, we want to make them part of the family! Pets adopted from One Love Animal Rescue will be on flea and heartworm prevention if of age, as well.